We stand behind our products. In case of any problem we will help. Receive it within 24 hours from order! Made of high-quality materials, the wall shelf is sturdy and durable. Assembly is very easy. With an invisible mounting system, the shelf can be easily mounted to the wall. The display shelf suits any decor and will turn an empty wall into a feature! WOLTU RG9231sz Floating Shelves Set of 4 Wooden Wall Shelves Wall Storage Round Shaped Display Shelves Black-White. WOLTU U#291 Floating Wall Shelves Round Set of 4 Storage Lounge Cube mounted Display. This display shelf will suit any decor and turn an empty wall into a feature! This hanging shelf is made of high-quality MDF with a matte finish. Material: MDF with a matte finish. 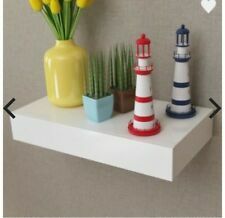 Shelf size: 48 x 25 x 8 cm (W x D x H). WOLTU Floating Shelves Round Floating Wall Shelves Set of 4 CD DVD Toys Storage Display Shelf Wooden with Insert,Black and White. Made of high-quality materials, the wall shelf is sturdy and durable. Assembly is very easy. With an invisible mounting system, the shelf can be easily mounted to the wall. The display shelf suits any decor and will turn an empty wall into a feature!Colour: White. White MDF Floating Wall Display Shelf Book/DVD Storage. This display shelf will suit any decor and turn an empty wall into a feature! This hanging shelf is made of high-quality MDF with a matte finish. Colour: Oak. The display shelf suits any decor and will turn an empty wall into a feature! Made of high-quality materials, the wall shelf is sturdy and durable. Assembly is very easy. With an invisible mounting system, the shelf can be easily mounted to the wall. The display shelf suits any decor and will turn an empty wall into a feature! Made of high-quality materials, the wall shelf is sturdy and durable. Assembly is very easy. With an invisible mounting system, the shelf can be easily mounted to the wall. They can also be easily removed for cleaning or moving. Material: High quality MDF. It also features two solid hooks underneath the drawers for hanging jacket, hat or handbag,etc. It can also be used as a peg with two hooks underneath. Made of high-quality materials, the wall shelf is sturdy and durable. Assembly is very easy. With an invisible mounting system, the shelf can be easily mounted to the wall. Invisible mounting system. 1 x High Gloss black shelf. Second picture for illustration purpose only. Max load per shelf is 8kgs when it fully fixed. We aim to resolve any problem as quickly as possible. Chests of Drawers. It also features two solid hooks underneath the drawers for hanging jacket, hat or handbag,etc. They can also be easily removed for cleaning or moving. Bookcases, Shelving & Storage. They can also be easily removed for cleaning or moving. It also features two solid hooks underneath the drawers for hanging jacket, hat or handbag,etc. Garden & Patio. Toy&Hobbies. All our products are warrantied and designed for use within the UK. They can also be easily removed for cleaning or moving. It also features two solid hooks underneath the drawers for hanging jacket, hat or handbag,etc. It can also be used as a peg with two hooks underneath. Wall Shelves Cube Floating Wall Mounted Shelf MDF Set of 3 White URG9236ws. Material: Wood/lacquered MDF. Woltu Floating Wall Mounted Shelf MDF Set of 3. 3 cube shelves in 3 different sizes; Shelf thickness: 1.6cm. Woltu Floating Wall Mounted Shelf MDF Set of 3. Material: Wood/lacquered MDF. Wall Shelves. 3 x Set Floating Wall Shelf Floating Shelves Storage Lounge Cube mounted u064GBP 27,99-28,49. Colours(interior) of choice: Dark Green;Dark Pink;Yellow;Green;Orange;Red;Black;White;purple;stoll green;bright red;lake blue. Wall Shelves Floating Wall Storage Lounge Board Mounted Display Shelves Set of 3 Rosa URG9239rs. Material: Wood/lacquered MDF. Woltu Floating Wall Mounted Shelf MDF Set of 3. Wall Shelves. 3 board shelves in 3 different sizes, Shelf thickness: 2cm.